In the run-up to the much awaited WWDC 2015, Apple has created a new collection on the AppStore - “Apps for Developers” showcasing apps that can help developers bring their innovative ideas to life. 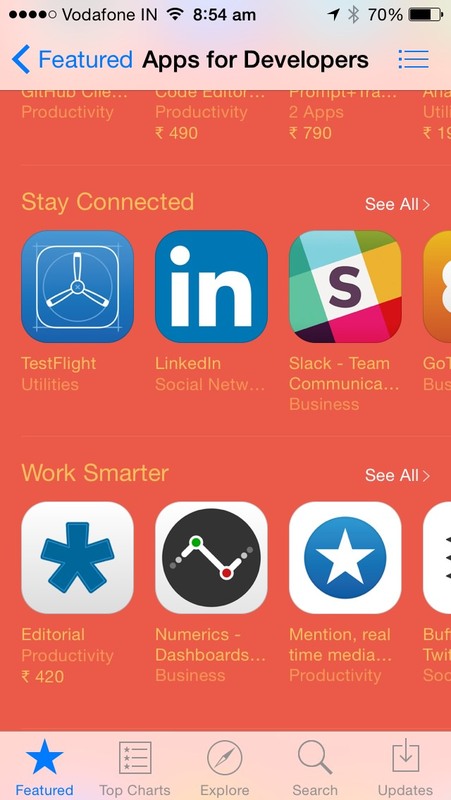 We are proud that Numerics is featured on the list alongside some of the gems of the app industry under the “Work Smarter” section. Numerics is showcased in over 70 countries including the United States. Numerics securely connects with a variety of services that can help developers be more efficient through their product development cycle. The Basecamp, Github, Pivotal Tracker and Trello widget packs in Numerics keep the developers aware of the progress of the app development. While integration with HockeyApp, Flurry and Google Analytics enable them to track the crashes in their apps, trend of active users or retained users and more. AppFigures widgets offer some great insight on an app’s daily or monthly downloads and sales. The unique Custom JSON integration empowers developers to connect and pull important numbers from their custom web systems and APIs. Numerics integrates with over 25 services and we are constantly working to add more integrations. Numerics is available for the iPhone, iPad, Apple TV and Apple Watch. Developers can use Numerics to display dashboards in their offices on a big screen from their iPhone or iPad, using AirPlay or HDMI. Numerics for Apple Watch further enables developers to stay focused and make better decisions by notifying them about their key performance indicators. Go ahead and get the relevant widget packs until the discount lasts and have a great week!